Saint Cyril, Archbishop of Jerusalem, was born in Jerusalem in the year 315 and was raised in strict Christian piety. Having reached the age of maturity, he became a monk, and in the year 346 he became a presbyter. In the year 350, upon the death of archbishop Maximos, he succeeded him upon the Jerusalem cathedra-seat. In the dignity of Patriarch of Jerusalem, Saint Cyril zealously fought against the heresies of Arius and Macedonias. In doing so, he brought upon himself the animosity of the Arianising bishops, who sought to have him deposed and banished from Jerusalem. In the year 351 at Jerusalem, on the feastday of Pentecost at the 3rd hour of the day, there occurred a miraculous portent: the Holy Cross appeared in the heavens, shining with a radiant light. It stretched forth from Golgotha over the Mount of Olives. Saint Cyril reported about this portent to the Arian emperor Constantius (351-363), hoping to convert him to Orthodoxy. The heretic Akakios – deposed by the Council of Sardica, was formerly the metropolitan of Caesarea, and in collaboration with the emperor he resolved to have Saint Cyril removed. An intense famine struck Jerusalem, and Saint Cyril went through all his own wealth on acts of charity. But since the famine did not abate, the saint began to pawn off church items, buying on the money in exchange wheat for the starving. The enemies of the saint mongered about a scandalous rumour, that they had apparently seen a woman in the city dancing around in clergy garb. And taking advantage of this rumour, the heretics by force threw out the saint. The saint found shelter with bishop Siluan in Tarsus. After this, a Local Council gathered at Seleucia, at which there were about 150 bishops, and among them Saint Cyril. The heretical metropolitan Akakios did not want to allow him to take a seat, but the Council would not consent to this. Akakios thereupon quit the Council and in front of the emperor and the Arian patriarch Eudoxios he denounced both the Council and Saint Cyril. The emperor had the saint imprisoned. When the emperor Julian the Apostate (361-363) ascended the throne, seemingly out of piety he repealed all the decrees of Constantius, directed against the Orthodox. Saint Cyril returned to his own flock. But after a certain while, when Julian had become secure upon the throne, he openly apostacised and renounced Christ. He permitted the Jews to start rebuilding the Jerusalem Temple that had been destroyed by the Romans, and he even provided them a portion of the means for the building from state monies. Saint Cyril predicted, that the words of the Saviour about the destruction of the Temple down to its very stones (Lk. 21: 6) would undoubtedly transpire, and the blasphemous intent of Julian would come to naught. And thus one time there occurred such a powerful earthquake, that even the solidly set foundation of the ancient Solomon Temple shifted in its place, and what had been erected anew fell down and shattered in dust. When the Jews nevertheless started construction anew, a fire came down from the heavens and destroyed the tools of the workmen. Great terror seized everyone. And on the following night there appeared on the garb of the Jews the Sign of the Cross, which they by no means could extirpate. After this Heavenly confirmation of the prediction of Saint Cyril, they banished him again, and the cathedra-seat was occupied by Saint Kyriakos. But Saint Kyriakos soon suffered a martyr's death (+ 363, Comm. 28 October). After the emperor Julian perished in 363, Saint Cyril returned to his cathedra-seat, but during the reign of the emperor Valens (364-378) he was sent into exile for a third time. It was only under the holy emperor Saint Theodosius the Great (379-395) that he finally returned to his archpastoral activity. In the year 381 Saint Cyril participated in the Second OEcumenical Council, which condemned the heresy of Macedonias and affirmed the Nicea-Constantinople Credal-Symbol of Faith. Of the works of Saint Cyril, particularly known are 23 Instructions (18 are Catechetical for those preparing to accept Holy Baptism, and 5 are for the newly-baptised) and 2 Discourses on Gospel themes: "About the Paralytic" and "Concerning the Transformation of Water into Wine at Cana". At the basis of the Catechetical Instructions is a detailed explanation of the Symbol of Faith. The saint suggests that the Christian should inscribe the Symbol of Faith upon "the tablets of the heart". 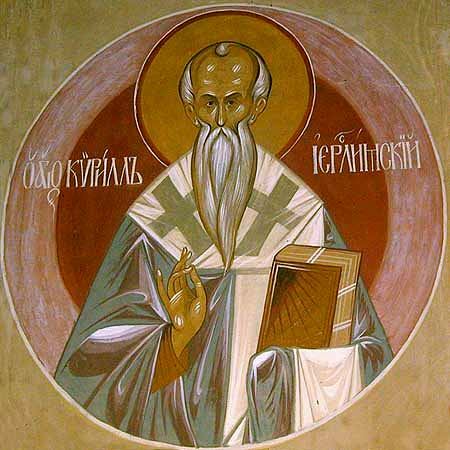 "The articles of the faith, – teaches Saint Cyril, – were compiled not through human cleverness, but has therein gathered everything most important from all the entire Scripture, and as such it is compiled into a single teaching of faith. Just as the mustard seed within its small kernel has within it contained all its plethora of branches, thus precisely also does the faith in its several declarations combine all the pious teachings of the Old and the New Testaments". Saint Cyril died in the year 386.